I invite you to please come and check out Winterfest on Sunday Nov. 3rd! This amazing fundraising auction to help support the SF Bicycle Coalition will be taking place at the Metreon from 6pm-10:30pm. Will be lots of art, entertainment, bikes and beer! I have a new drawing from my “Monks Math” series included. Don’t miss the San Francisco Bicycle Coalition’s 18th annual Winterfest fundraising auction and member party is the biggest bicycle bash in the Bay Area. Since 1995, Winterfest has become the year’s “must-go” event for our members, as well as local business owners, political decision makers, and bike industry leaders. Winterfest captures the energy of the San Francisco bike riding community – a fun, supportive, and diverse group of people who come together to celebrate the SF Bicycle Coalition’s successes of the past year, show support for our organization and purchase new bikes and local products. The evening’s festivities include a bike and silent auction, a 50-piece local art auction, entertainment, nibbles, drinks, and more. Check out more information: Winterfest Main Page, Art Show and Bike Auction! Thanks to the generous Winterfest Sponsors! Peter Foucault artwork in Root Division Art Auction Thursday October 24th! Hope all is well as Fall settles in. If you are in the Mission District tonight I invite you to please swing by Root Division and check out their annual art auction! An amazing event featuring the artwork of over 100 local artists. I have a new work on paper included. Come support art, artists, & arts education in San Francisco! This fundraising event presents an eclectic mix of quality artwork from over 100 established and emerging local artists. Take a chance, throw your hand up in the air, and return home with an inspiring, affordable, and original work of art. Proceeds benefit local emerging artists, as well as Root Division’s free after school art classes for Bay Area youth. Preview the Auction Web Gallery! Featuring food, specialty cocktails, and live DJs Basic A, Mixed Greens & Roll (Early) & TS (Good Life)! Host Level Tickets: Starting at $125, you receive VIP benefits*, reserved seats, and more! *VIP tickets include early viewing and bidding, complimentary appetizers, live music, and a limited-edition artist-designed tote filled with goodies and gifts! Check out the list of participating artists! Copyright © 2013 Root Division, All rights reserved. Root Division’s mission is to improve appreciation and access to the visual arts by connecting personal inspiration and community participation. We provide subsidized studio space to working artists in exchange for their service in creating shared learning opportunities for the community. Artists develop creatively and professionally by teaching art to underserved youth, leading adult education classes, and producing exhibitions that showcase local emerging artwork. By combining multiple opportunities for creative exchange, Root Division cultivates an artistic ecosystem that enriches life throughout the Bay Area. Root Division is supported in part by grants from The Andy Warhol Foundation for the Visual Arts, Walter & Elise Haas Fund, Drusie Davis Family Fund, Grants for the Arts: San Francisco Hotel Tax Fund, San Francisco Arts Commission / Cultural Equity Grants, Zellerbach Family Foundation, W A Gerbode Foundation, Fleishhacker Foundation, Art4Moore, A Better Place Foundation, and Bill Graham Memorial Fund. Peter Foucault/Chris Treggiari MAP installation at SFAI Alumni event Saturday Oct. 19th! We are pleased to announce that MAP was invited to participate in the upcoming SFAI alumni event on Saturday Oct. 19th. 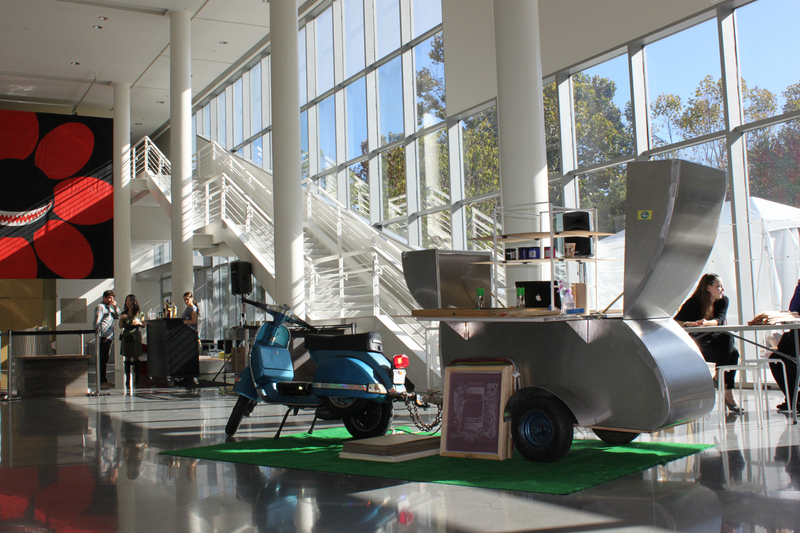 We will be setting up the Mobile Vespa Screen Printing cart in the courtyard of the Chestnut Street Campus from 5pm-8:30 pm and inviting attendees to create a free and interactive take away poster. For this project we collaborated with SFAI Professor Art Hazelwood and two of his students, Francisco Lopez and Alex Hernandez. Here is some info on the event, hope to see you there!